You know the way people said that it was only 6 man babies and a cat living in their mother's basement that didn't like The Last Jedi? Yeah? You know the way they said that Solo would beat Black Panther in pre-booked cinema seats? Yeah? Well, you know the way despite those two unassailable facts foisted upon us by the media that Solo has now completely bombed in the wake of a boycott movement? Yeah? Well thank The Last Jedi for that. Anyway, to cut to the chase The Last Jedi was a woeful Star Wars film (that's a fact, sorry) and the first issue of this Gary Whitta penned travesty still managed to underperform against my very low expectations. Some might even say it subverted my expectations. I wonder how this one will be? Oh well, at least they didn't put Leia Poppins on the cover...oh wait...what?!?!?! 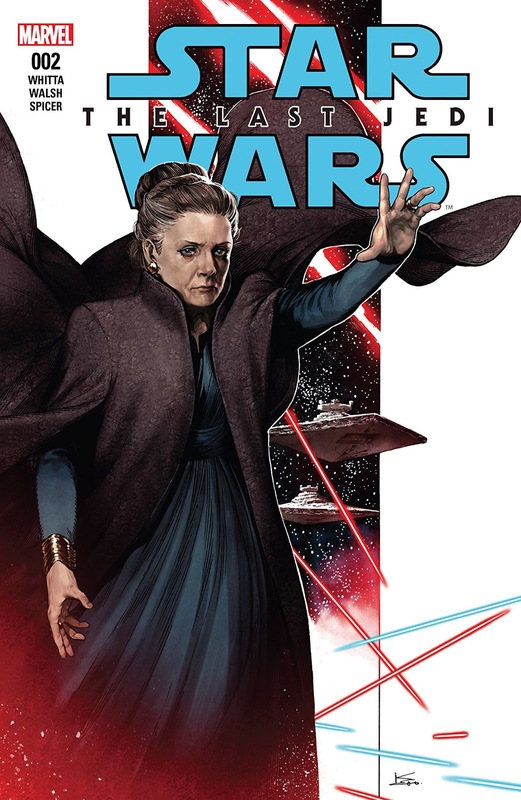 Yes, as if it wasn't bad enough that Rian Johnson had to make a laughing stock of Carrie Fisher in her last outing in her iconic role as Leia, this comic book doubles down on that by putting the worst goddamned scene in Star Wars history right slap bang on the cover! What? So it is no surprise that, despite Gary Whitta managing to paper over The Last Jedi's cracks by omitting some problematic aspects in issue 1 this issue gives us the most, absolutely the most, excruciating panels I think I remember ever seeing in a comic book. Leia flying like Superman having a bad dose of leg cramps - she needs more salt in her diet - maybe she should lick some off the ground when she gets to Crait. Listen up Lucasfilm, there is no way that you can depict that Leia Poppins scene in any way that looks good so just give up now, and cut it out of the film in a Special Edition in 10 years time. The scene here is even worse and more protracted than in the film. Yes, it's true. Elsewhere we are treated to more artistic delights of the type that horrified me last time out. 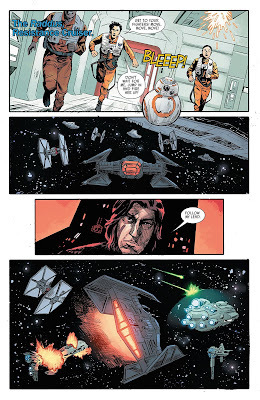 Kylo Ren's face in this issue...good God! He looks like Max Von Sydow after suffering a bad stroke, more than Adam Driver. For a confused moment, I was wondering why we had Lor San Tekka flying in to attack the Resistance fleet. Ackbar looks like a Yankee Candle extravaganza that has gone wrong which gives his face a melted look...another goddamned screen icon treated like crap incidentally. Meanwhile, genius that Whitta is he omits the death of a character who was one of the few who (albeit briefly) displayed a bit of charisma in The Last Jedi, Callie "Bombs away" Spencer - ruthlessly killed off by Rian Johnson and wasted in a short outing. 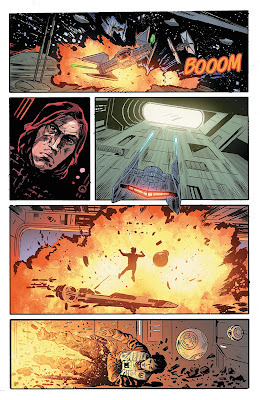 Here not even shown dying in the explosion (unless that is supposed to be her running alongside Poe in one of the panels, in which case it doesn't look like her). Yes, I hate this adaptation as much as I hate the film. I had sincerely hoped it would be good so that it could take the film's place in my rewatches. How this is going to be strung out for another 4 issues I do not know, it will make the most excruciatingly long cinematic "space chase" scene into the most excruciatingly long comic book plots. 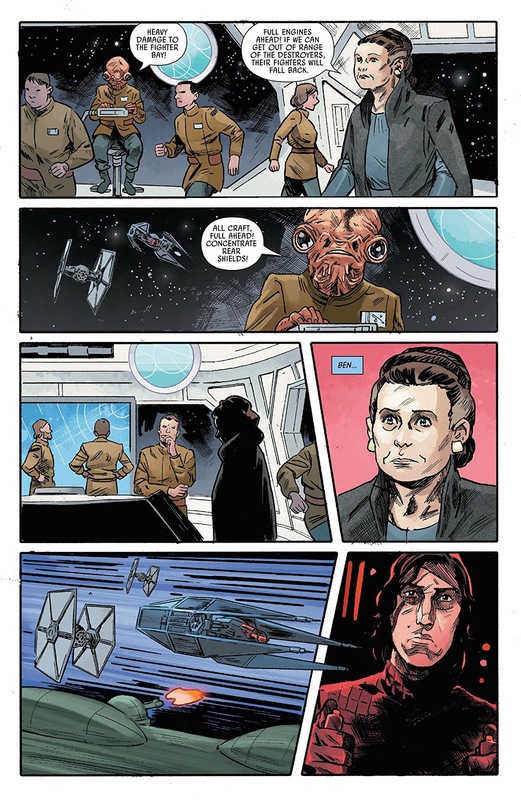 Gary Whitta should probably not bother with comics again, this is terribly written. The art meanwhile is woeful. 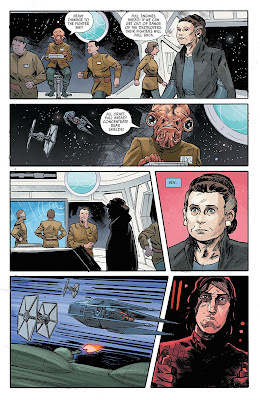 I mean look at the page above, Leia looks like she has been hit in the face with a frying pan or someone who experimented with budget plastic surgery. Sorry folks, but I'll continue to review the whole series in the hopes that things improve. Maybe the series will subvert my expectations.